Anita solves the Matt mystery for those that are still wondering. Walker is working, he told Starrett. He and two others own a Gulfport company called Precision Marketing Group. Anita does not identify the two people with whom Scott Walker is working but she left a clue that dovetails in nicely with something a source with knowledge of the Mississippi political landscape, who requested anonymity, mentioned to Slabbed in confirming a local tip that I received that Hancock County Board of Supervisor Steve Seymour was planning a run for the Southern District PSC seat vacated by Leonard Bentz. So who is Precision Marketing Group? Sources with knowledge of Scott Walker’s marketing activities indicate to Slabbed the work involves signing up BP plaintiffs. The same source indicates the third person working with Walker is Supervisor Seymour. There is nothing wrong with these guys making a buck together and all three have very good people skills so marketing legal services for others is a natural fit. It also solves the age old mystery of the Lynn Fitch fundraiser as told realtime by James at Jackson Jambalaya as Supervisor Seymour, purportedly then a Democrat, was an honorary host for the Republican Fitch at the Walker hosted fundraiser. Scott Walker has been a money train for Fitch since she first ran for office in 2011 and on its face Supervisor Seymour did not fit with the others. It now makes sense. The same source with knowledge of the Mississippi political landscape, who requested anonymity per above, indicates to Slabbed that the relationship between Seymour and Walker is already being discussed at the money level of politics because to run in 2015 means laying the money foundation now. Lawyers like Arthur Madden do not come on the cheap and funding a criminal prosecution defense takes a big toll on one’s net worth. That pressure is showing. That was the first thing that crossed my mind when I read the name of Matt Campbell this morning. The other suggested name the other day was Matt Hill who as a coincidence is employed at the DMR and did not really make sense to me. The two partners of Scott Walkers are running for cover this morning I bet. They will be determined by noon if not sooner. Eye-Spy will have their favorite beer posted soon. Spy is the best at getting this type of info. Where yat Spy? Wow!! I must have missed the rest of the post. Quicker than I thought. Time to dig down. I am here. To Doug’s point I also believe that there will probably not be any more indictments. On that note, since there are already people on the chopping block, I would find it hard to believe that they would keep digging on the state investigation. More especially if there are more people involved that are imbedded within the regime. That’s my personal opinion even though I would actually keep digging myself. As a tax payer, I am one who is still concerned about all the land purchases and all grants that were processed though the DMR. It makes me wonder if those were all looked at closely. If all were looked at and are legit, good deal. One reason among many as to why I am still very skeptical about the state government is the fact that many were issued civil demand letters and for some reason one is still employed with the DMR according to what I was told. If this person is actually still employed at the DMR, then why? After all, most of us on slabbed have heard Pickering flapping his lips about “the culture of corruption” among other statements. I can’t speak for the utility authority other than a few comments by people on slabbed. It makes me wonder what’s cooking in that pot. Due to the nature, the method, and high profile status of the DMR investigation, I would not be surprised if other shocking information were to surface before its all said and done. In due time, the public will be enlightened. In my opinion what is cooking in the HCUD pot is some of they same that has been served up at the DMR. The misuse of CDBG monies, paying inflated prices for land from connected individuals, padding contractor bills to benefit some who serve on the board, loans or gifts to decision makers ect, ect. The relationship between S. H. Anthony and the previous director is where it started but not where it will end. Then you have all of the money given away to the Barbour’s friends in Jackson before the first shovel of dirt was turned over. These amounts are totally out of industry standards for soft costs as a percentage of total costs on similar projects. But hey, who was counting? This was Katrina. The completed River Hills treatment facility and how it came to be in its current location without one single customer connected several years later is enough to send several people to prison in my opinion. There are many more situations like it. Who is paying for all of the upkeep of all the unused infrastructure? The sewer and water customers in the 5 Harrison County cities are. And there is no end in site. Just in case Scott Walker was not good in math at the Hotty Toddy School of Schemes 1% is what they charge is monthly, which adds up to be 18% per year. That is as much as he is probably paying for the lease on that new S550 Mercedes they have been tooling around in with the Ole Miss specialty tag on board. The windows are tinted to conceal the passengers but you can be sure it is him if it has that special tag with the #R3897 set in a Mercedes of South Mississippi frame. Source: No additional DMR Indictments expected. Same source: All eyes on the Harrison County Utility Authority. 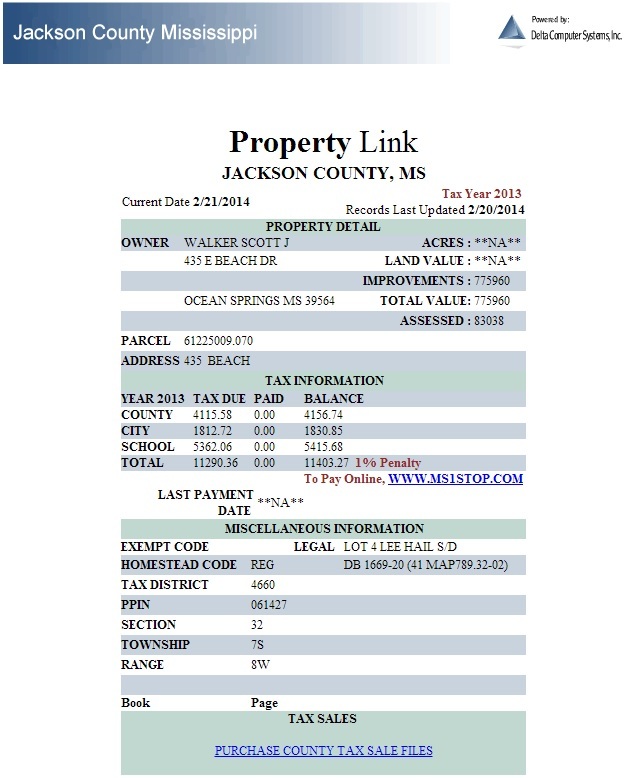 As stated before on Slabbed, Bill Walker had the financial liability on Scott Walkers Gulf Hills lot. What we did not know is the fact that they were struggling to make the payments to the bank. This is the reason for the sale that was the idea of Bill Walker so he could get out from under the debt. I remember when he was confronted about the transaction/sale of the lot and he said “Scott sold the lot for less than he paid for it and lost money.” This was more or less a favor to the environment to help save the green heron. And that friends is as truthful as Bill Walker’s “not guilty” plea he originally made when indicted. His whole career at the DMR was built on lies, greed and cronyism. He deserves to be sentenced to the maximum for what he has done and forced to repay all monies he misused. I have asked this question here before, and I will ask it again as it baffles me. Why wasn’t Tina Shumate charged with a felony indictment for purchasing her parents’ land with a federal grant program she managed? How is that different from what the Walkers did? From a legal standpoint? Any ideas? I think they did things properly. It was the only one that seemed to go for appraisal price. I’d like some scrutiny on the Swetman transaction. That one went for 7000% more than tax assessor value didn’t it? It also didn’t meet the intended purpose of the grant if I recall correctly. It may have been purchased for the appraised value but it belonged to the program managers parents. It seems like her parents benefited from her position of authority. That doesnt appear any different than the purchase of Scott Walkers. Why is that purchase a conspiracy and a criminal act and none of the other CIAP purchases were classified as such? If Shumate was charged with conspiracy along with the Walkers to buy Scott Walkers property it would be reasonable to assume that she might would conspire with Walker to buy that property belonging to her own family? Tell me, what’s the difference between the two acts? Did someone check the wrong box on the paperwork which opened up a loophole? I think Doug would agree… If history teaches us anything with these cases, once they get the main targets, they have the notch in the gun and stop. Don’t expect them to clean up the loose ends! In deference to your seniority I’ll simply add Aye! Isn’t Tina’s father the former Public Service Commissioner Curt Herbert? I remember when he was runnning for a full term we called his house on a weekend to make sure he was going to a political rally later that day – he was out by his pool having a good ole time! This is Tina Shumate’s brother, a lawyer by education who now works for I believe Entergy as chief council. I also cannot understand why she was not implicated in the conflicted sale/purchase of her parents property which probably had no market value because of elevation after Katrina. Of course she arranged for them to cash out. There is no justifiable for CIAP monies being used to purchase this type of infill lot and should be viewed just as the Scott Walker transaction. That’s correct. Hebert was on the Mississippi PSC and was a Bushie appointee to the FERC. Here are a few links that date back to when he was carrying water for ENRON. Doesn’t sound like the kinda guy we need as a Supervisor or as a member on a Solid Waste Authority, and especially not on the Public Service Commission. I can shed some factual light on the issue of why Tina Shumate’s parent’s property is different than the Walker’s illegal property sale. Dr. Walker was a co-signer with Scott on the M & M Bank loan used to purchase Scott’s property on Bay Sweep. Years later, Dr. Walker had Tina Shumate go to the Land Trust to ask them if they would take the Bay Sweep property if the DMR found funds for them to do it. By doing this, Dr. Walker was approving granting DMR funds to pay-off a mortgage he co-owed. There was a large balloon note due on that mortgage in July. DMR gave the money to buy the property in June. That is the illegal part. There was no such connection paper trail of direct financial gain in the Shumate tranaction. What has not been talked about is why Scott bought that Bay Sweep property in the first place. Here is some light on that. When Danny Guice was gonna step down as State Rep, Scott was supposed to be appointed by the powers that be to fill that slot. He needed a residence in the district to qualify. Then Danny Guice decided to support his Cousin Jeff Guice to take over his seat. Yes folks, you are right to see the dotted lines. It is the same Danny Guice who was brought in to DMR as Dr. Walker was headed out. I half way see what you are saying but there must have been program procedures in place which outline what and how properties were to be purchased. It strongly appears that a large portion of the land purchases were connected with direct relatives or close friends of Walker and Shumate. If you think about it, they both used their positions in government to provide a limited service directly to their relatives. Was that service open to the public to cash in on? I sure as hell dont remember because if it were i would have cashed in quick with the rates they were giving. Also, I have heard the Hebert property is out in the sticks. What value is that to the DMR or the state? Was there a make shift blue Herron hatchery or other marine life on the property living in bathtubs? Ya, that may have been the same Danny Guice but it was also the same Danny Guice who started cleaning house and making it happen far quicker than the bozo on the 6th floor now. I cannot vouch on the level of support Guice allegedly gave his cousin and it may be blown out of proportion. Speaking of family support, tell me how you think the Hebert sisters got on with the DMR? I meant no disrespect at all to Danny Guice. For all I know of him, and from people I respect who do know him well, he is a very good man and did a good job during his time at DMR. The issue of DMR policies spending post Katrina money on coast properties is an interesting question. Any DMR or State or federal internal directives or guidelines defining what properties should be purchased to reduce repetitive loss would be fascinating to see. How and who got their property purchased in some cases is obvious and in other purchases seem beyond reason. What seems obvious is that no one was checking Dr. Walker’s decisions at all. His supervisors are not as guilty as he is, but they are not blameless by any means. One of the laws that was broken by the Walker’s was the use of federal and state monies to pay off a debt that resulted in personal gain. Dr. Walker could have stepped aside because of his obvious conflict of interest and let someone else not under his supervision sign off on final approval of purchase of the property he and Scott had a mortgage on together. The arrogance of his assumption that others were too stupid to notice is apparent. He was wrong about that from the day he signed those papers. Whether the Shumate property purchase was a quid pro quo for Tina Shumate being part of the Walker’s property is an interesting question to consider. Look at their pattern in one deal after another. In each situation that has been exposed, the Walker’s let their partners in deals and crimes profit just enough to make it worth their while. Then the partners have to keep quiet to protect themselves as well protect the Walkers. There were internal assessment sheets prepared by DMR staff on every single piece of property proposed for purchase by DMR. They are in the files, or were. “””””The report comes from the Office of Inspector General with the U.S. Department of the Interior and was obtained recently by the Sun Herald. 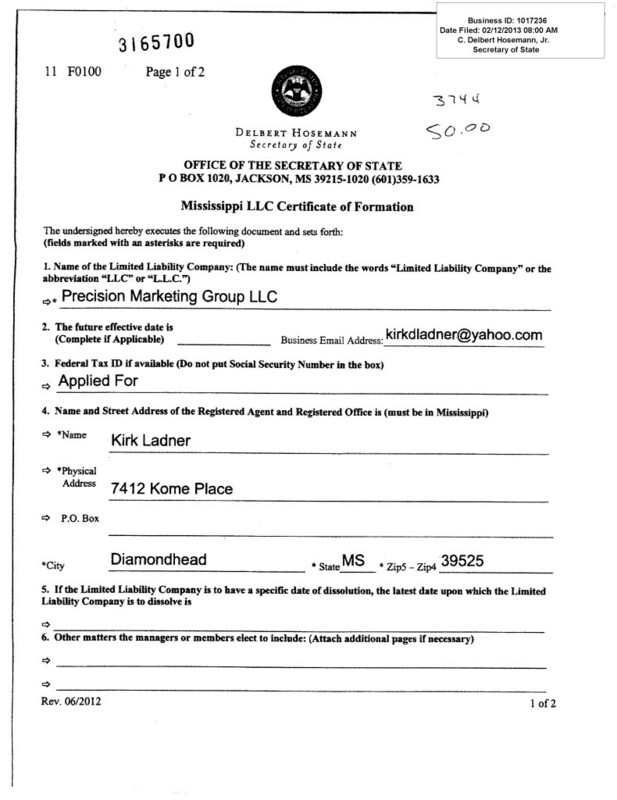 It also says the DMR used CIAP money to buy property in Pascagoula that belonged to the parents of Tina Shumate, the director of the DMR’s coastal management and planning office, which is over CIAP. “This employee administers DMR’s use of CIAP funds,” the inspector general report states. Calling this a potential conflict of interest, it also says the transaction was based on an appraisal that lacked adequate investigation and history of the property’s value. And was not supported by verifiable data. The property that belonged to Shumate’s parents, Curt and Ann Hebert, is a large lot at the end of Fern Street on a bayou, near the Pascagoula River. The county valued it at $176,000 and the CIAP grant to purchase it was $245,000. The auditor questioned most of the grant amount. Hmmm…..Big supporters of an open market on energy with less government regulation? The only thing good about that idea is the fat cats in big business would see their profit margins skyrocket at the expense of the customers and the environment. In other words, double or triple the electric bills because they would have you by the balls. I get the image of a family full of spoiled little brats who seem to get their way through political connections. Just my personal opinion. When the list of properties purchased by the DMR with CIAP money came out I decided to physically go to each site and see for my self what was being purchased and what benefit the public received. I am retired so I have plenty of time to spend on my private little war on corruption. In a past life I worked with appraisals and have very good knowledge of real estate. I drove to the other side of the world, Pascagoula, and found the lot on Fern St. that was previously owned by the Heberts. Nice enough area but all very low as evidenced by the amount of flooding during Katrina. In my most honest opinion the Herbert lot being low had no real market value or somebody else would have bought it. They purchaser of last resort was the DMR. I do not care what the so called appraisal they used for justification of the price paid stated, the market value is not $200,000.+. The benefit to the public is zero. What do you think it is being used for today? Nothing what so ever. Anybody who does not see this for what it is must not be looking. This was purchased for the same reason used to purchase the Walker,Harris,Reynold,ect.,ect. properties. A way for connected people to dispose of property they could not sell otherwise for the inflated purchase price. Tina Shumate is just as guilty of arranging for her parents to dump the Fern St. property in the lap of the taxpayers as Bill Walker is in the purchase of his son’s property. She is damn lucky not to have been indicted for this and should accept the part she played in the Scott Walker purchase as punishment for both. Maybe that is the only way to see it. I have a lot more to say about the other land bought at the direction of Bill Walker and do think this will all come to the surface soon. I also have a reason for saying that. I got to get back to Lawrence Welk reruns. Good evening all. I think what sent Danny Guice to the DMR was the desire by Phil Bryant to get him off of the Ms. Parole Board and put his own choice in his place. I have heard from a reliable source this was the consideration. I also told he was never a consideration for the job on a permanent basis. The governor dictated that Jamie Miller was to be the director even prior to resumes being submitted even though his was less qualified and not the choice of the CMR or others involved. Was he even in the final 3 submitted to the governor by the CMR? I have always said no and believe this will be revealed to be correct in the near future because certain people within the DMR/CMR want it known. I think most would agree that due to Miller’s own actions his time will be limited at this agency. As follow up to the question ‘why not Tina Shumate?’ While the connection/corruption angle should not be ignored, as a general practice if Tina was an early and open talker to the Feds, the Feds would not initiate a prosecution against her. Unlike seen on TV dramas, in South Mississippi, the Feds don’t do formal snitch agreements giving immunity or set pleas etc. Once indicted it is hard to avoid sentence recommendations, so the Feds just say that if you cooperate and make cases for them they won’t indict you. If I had to bet she was a strong and early hand in cooperating and her reward was simply to not be indicted. Raul,You must have missed the fact that she has been indicted and is one of the remaining defendants not to have an agreed plea deal. She was not charged with a crime for arranging for the purchase of her parents property with public money while she managed the CIAP program on behalf of the DMR. All of the questions on this subject are about why they did not pursue additional charges. I think most know the family involvement with the politically connected-R are the most likely reason not to involve her family’s property scheme. Biloxi, you are right she caught a case on the Walker deal but not the Hebert deal. My thought was that the Feds let the Hebert deal alone in exchange for cooperation. BTW – a little birdy told me, and I have no other way to verify, that on Friday night he saw a large moving truck emptying out furniture from the Walker beach front house. The move is inevitable. He has to be hemorrhaging cash with large fines and restitution ahead of him. No money coming in, lots going out. He must be getting ready to sell or he is going to moving into a smaller home, preparing to depart for ClubFed. It looks like ‘friends in high places’ are pulling out all the stops to protect the big wigs over this debacle we call DMR. Will the 5 DMR connected charged be slapped on the wrist, pay a minute fine and laugh all the way to the bank or the Cayman Islands on what they have pulled over the citizens of Mississippi? Will the Feds be called off the case or have they already jumped ship? Who is protecting whom? We know the state will not follow through on their charges except to make a political big stand by Stacey Pickering. But what about all the others that have not been charged but may have stolen millions from the state? The public has waited patiently long enough for answers and for a thorough housecleaning at DMR. Is there any hope for either? I read today in the Sun-Herald that there is some kerfuffle about concrete for reefs, and that Sen. Wiggins wants to fold all the money for the artificial reefs into the Seafood Fund. What good would that do? What is the seafood fund, anyway? I understand that Sen. Wiggins wants to distance himself from the scandal, I would too. The problem for me is that I, like the poster above, think that there is so much more hidden flotsam and jetsam. The ever helpful Sun-Herald let us know that there was money ripped off the artificial reef account, but no word on the Seafood Fund. Was money ripped out of that too and we don’t know it? How do we know it wasn’t if it wasn’t audited? Someone should give Sen. Wiggins a Yeti cooler full of fish fillets, he likes that I hear, and ask him to disclose all the money in the Seafood Fund and what it is used for. Don’t hate the game; hate the player…as a mammal who eats a lot of fish, especially snapper filets, I like the artificial reefs and use them. Just because Walkergate used them for ripping off the public doesn’t mean it is a bad program. Look, the YMCA, the Land Trust, the Heritage Fund, CIAP, Katrina recovery and Lord knows I can’t keep all the funds here straight, but they all got ripped off. If Sen. Wiggins wants to help, please take a look at those CIAP handouts disguised as “grants”, and how about some state whistleblower legislation? With rewards for good intel? Now that legislation would help a lot! Haha, rewards for good intel and whistleblowing? I invite you to contact Phil Bryant to see what he has to say about that. Ask him if knows who the whistleblower was who contacted the feds that started the investigation that eventually brought the Walker clan down. I am curious as to what he might say as the information has flowed through his office via email. Yes, I have been speaking of the CIAP grants for some time now. The main grant writer is still employed at the DMR as we speak who could probably elaborate on this subject a little more. Oh, and thank you for this valuable forum.